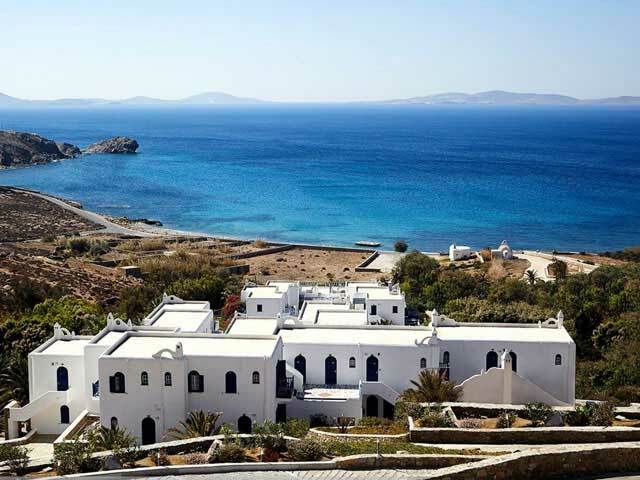 On the top of a rock, in the most beautiful corner of Mykonos, two unique water front villas were created with a lot of love and specially designed for persons and families who want to live the extra ordinary! 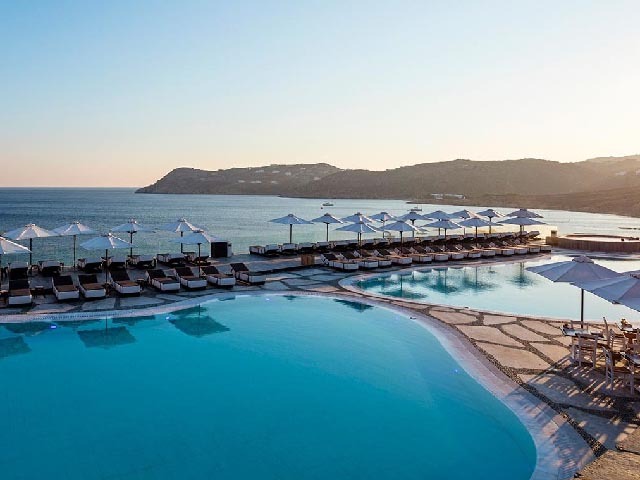 A quiet and dreamfull surrounding, dominated by the infinite blue of agean sea, the warm greek sun and the fabulous sunsets, create ideal conditions for everyone who needs to live a dream! Beaches of Mykonos Mykono's beaches are famous around the world. Crystal clear water and golden sand on many beaches on the island a few minutes away from the Luxury Villa. 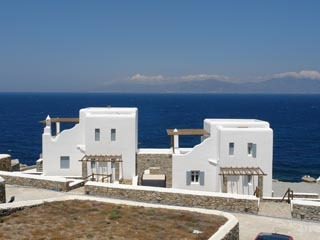 Mykonos Sand Villa Gallery Superb water front luxury villa of 300sq. meters, positioned on a rocky hill top at Pouli, with wonderful view over the Aegean Sea, the famous sacred island of Delos and Tinos and breathtaking sunsets. This ultimate resort with the highest level of style and character offers luxury, privacy and security. 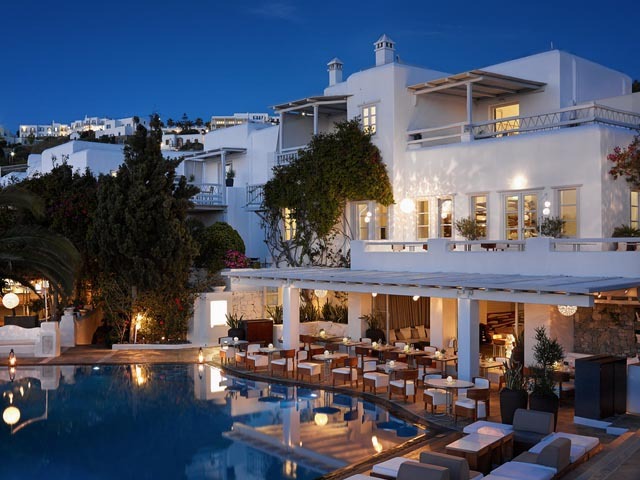 Designed by one of the leading Greek Architect and Interior Designer, has been published on the major Greek Home Design Magazines and has been shown on the Greek Television program “Design” as one of the best villas in Mykonos. There is a daily cleaning service and a daily technician supervisor for technical support and any kind of assistance you might need. Mykonos Sea Villa Gallery The Villa of Sea. Sleeps 10 ( 8 in the villa /2 in an attached studio). Superb water front luxury villa of 300sq. meters, positioned on a rocky hill top at Pouli, with wonderful view over the Aegean Sea, the famous sacred island of Delos and Tinos and breathtaking sunsets. This ultimate resort with the highest level of style and character offers luxury, privacy and security. 3 Large Double bedrooms, one with en-suite bathroom and two sharing a very large bathroom. 2 of the bedrooms have direct access to the large pool area with a large dining table and bbq. Large sitting and dinning room with a very modern and well equipped kitchen. Breathtaking view gives the impression that you are on a ship. Master bedroom with large open space bathroom and double basin. Large balcony with superb view.